Sir Paul McCartney's wife Heather is to appear on US TV without her prosthetic leg to draw attention to 1.2m deaths caused by road accidents each year. 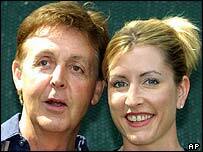 Heather Mills McCartney's left leg was severed below the knee when she was hit by a London police motorcycle in 1993. Nearly 20 years before that, her mother lost a leg in a road accident. Mills McCartney is supporting a World Health Organisation campaign to cut road deaths, which the WHO said could kill 2.3m people a year by 2020. Launching the year-long campaign, she said: "It took one human error to take my leg and one human error to take my mother's." She said many traffic deaths and injuries could be prevented if nations would focus on improving safety. "You really can fix this. It's just about more awareness," she said. In a taped message played at the launch, US President George Bush called road safety "a significant worldwide health issue". He said law enforcement and an increased use of seat belts had helped to reduce US deaths. World Bank vice-president David De Ferranti called traffic deaths "an unequal killer" because 90% happened in low or middle-income countries. In 2002, crashes killed 28 out of every 100,000 people in Africa, compared to 14 out of every 100,000 in the US.